There are many elements which contribute to home décor. The chosen accessories, flooring, paint colours of the walls, and even the arrangement of furniture in every room will impact upon the overall look. There is, however, one detail that can make all the difference in the world, and it is often overlooked: the roof. The ceiling is able to give the environment a touch of charm and originality. 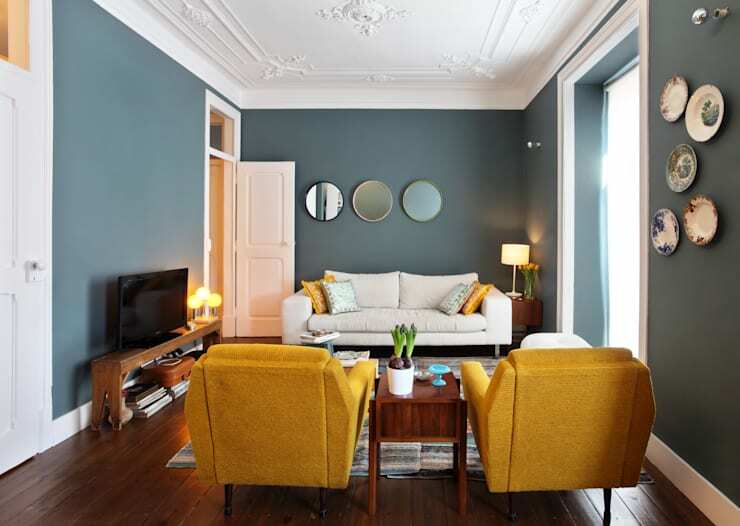 When a house has very high ceilings, the plaster lining is an alternative for those seeking a sophisticated atmosphere, modern look, and clean environment. 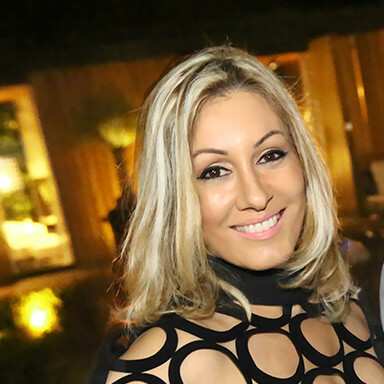 The material can be combined with a specific lighting design, providing many different visual aesthetics. Moreover, the plaster allows for different creations in skirting, lowering ceilings, walls, mouldings, and frames, as well as being light and easy to install. In these examples we bring you today, the relegated ceiling is an excellent alternative that brings more closeness and a feeling of warmth to the home. It also influences the thermal sensations and acoustics of the house. Plaster ceilings, such as crown moulding and the use of openings in the plaster, assist in the distribution of light in the room. The frames also feature functionality, it helps hide the wiring and functions as an excellent technique of intelligent decoration to modernise your environment. Take a look at the article below for some great decorating ideas using plaster in your home! 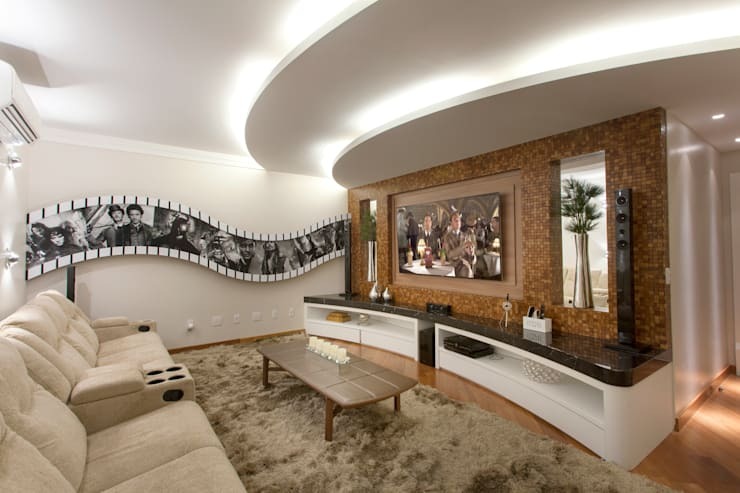 This TV room, designed by the architect Achilles Nicolas Kilaris, hosts a structure in curvilinear plaster, which follows the curvature of the wall, ensuring a noble and distinguished effect in this room. The crown moulding for the lighting is reversed and open, facing the front of the room, causing the light to come from the inside out and ensuring a rich and cosy atmosphere. To see another awesome TV room, follow the link to: Behold! The High-Tech Home. 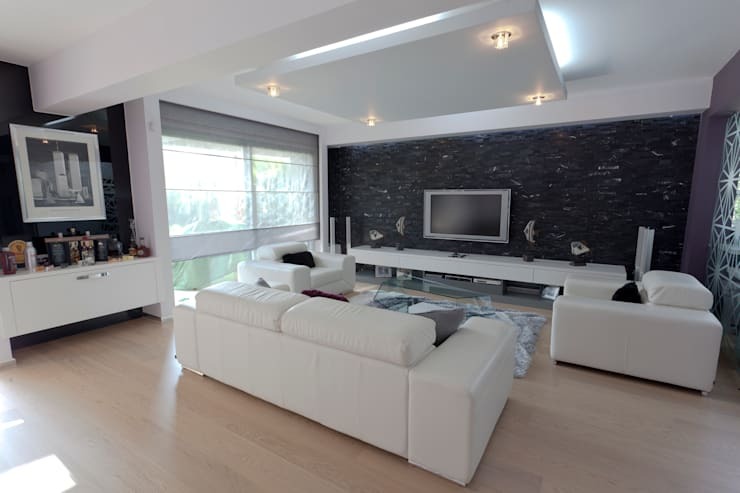 In this living room we find a minimalist style, with white coloured furniture and further enhanced by the lighting to emphasise the modern space. The plaster structure is square in shape and applied to the roof, allowing the passage of light through the gap between it and the ceiling. In conjunction with this, the corners of the cubic structure hosts a warm yellow light each at the end of the gypsum board. This generates a sophisticated atmosphere and keeps a clean line for this family atmosphere. 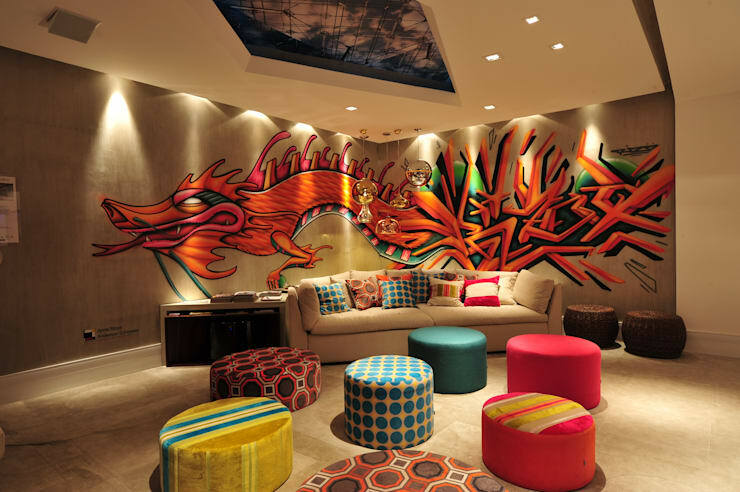 This media room is more fun and has a more colourful style, where the lighting makes all the difference, representing a more jovial and warm atmosphere for the room. The inverted crown moulding highlights the perimeter lights on the walls, whilst the room lacks natural light and is complemented by a few centralised ceiling lights. The indirect illumination from the ceiling, reflected by the light plaster recesses does not hinder those who are relaxing in this bed, but does generate a more comfortable and light mood for the room. Meanwhile, the floor lamp on the side of the bed ensures a sharper focus, forming more intimate lighting. 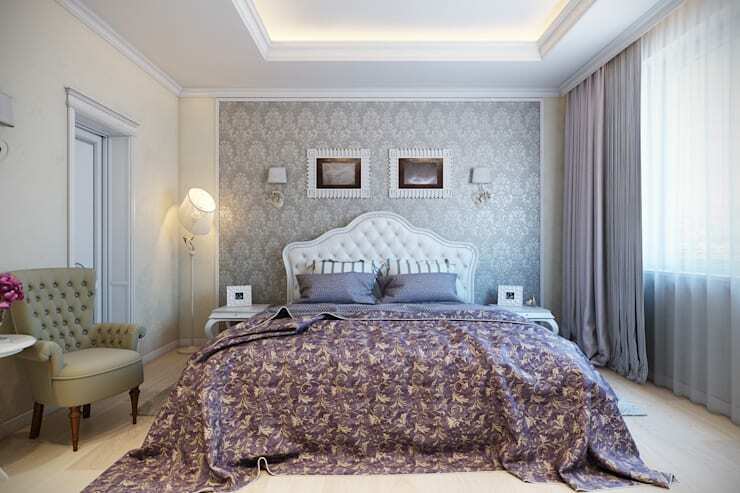 The plaster on the ceiling design centres the bed and makes for a harmonious composition for this double room. For a classic room, the ceiling can have more decorative plaster which is also more elaborate. This is a good option for those who do not enjoy a more modern look and directed lighting. There are different materials like plaster and Styrofoam that can be installed directly on the ceiling or in a plaster recess to create beautiful frames and give a different touch to the living room. In this project, the plaster is in a curved shape, and does not only embed indirect lighting to provide more exquisite lighting, but also enhances the décor of this young room. The lighting in this room deserves special attention. Embedded in a plaster lining, the set of pendant lamp rails create pockets in places, forming an interplay of light and mixing the clear and warm colours to create a temperate climate in the room. Certainly, the lighting makes a big difference in any wardrobe or larger closet, as it allows you to better see your clothes and leave the space super charm and warm. In this project, designed by Projecta Architecture, the ceiling of the closet has a plaster structure with gypsum board and centralised lamps on the border. This provides a more stylish finish and enhances this space to a noble status in the home. In this space, natural and artificial lighting are brought into perfect balance. 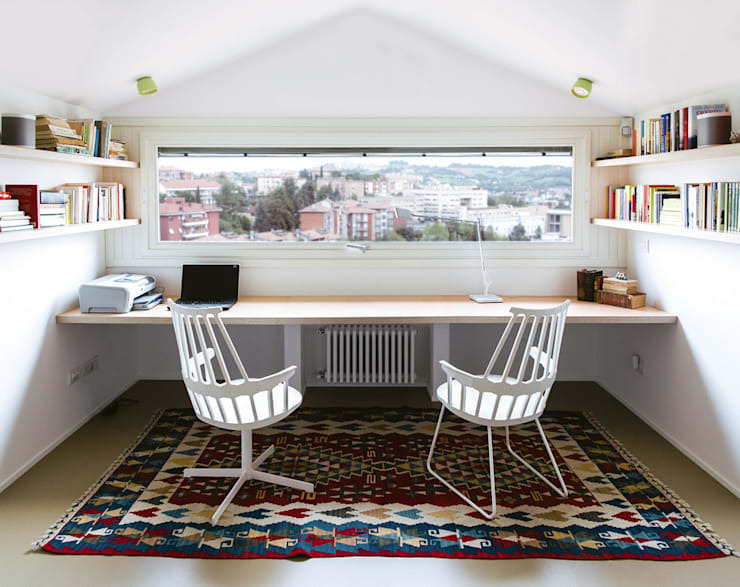 The office becomes a cosy space to work and study. The plaster recess in shape, in an environment with clear and simple décor, making the natural light from the window flow in more easily. This simple detail also houses built-in artificial lighting. The flexible ceiling lights can be steered towards the table, perfect for task lighting. 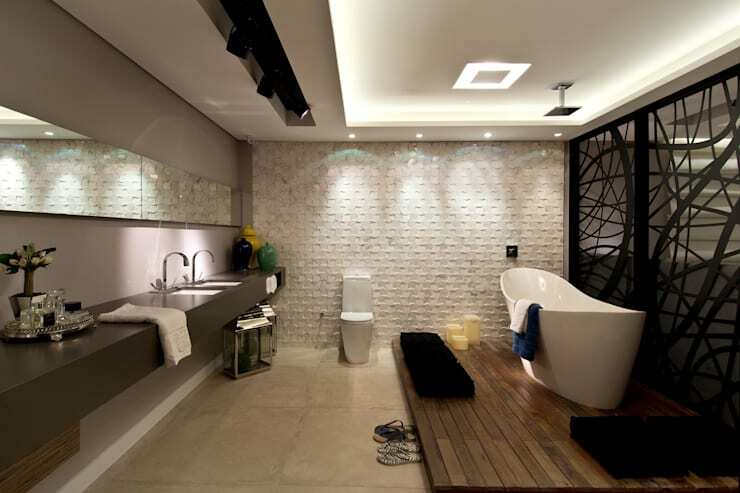 The interior design firm, ArchDesign, created this bathroom where the plaster ceiling is lowered in cut-outs. In the centre, we can see open crown moulding that is illuminated from the inside out. This emitted light is indirect and softer, ideal for the bathroom. Above the basin space used for personal hygiene, shaving or make-up, we can see a tear in the gypsum which host a rail of spotlights. This provides targeted lighting on the mirrors, thus preventing light falling directly on your face or conflicting with the main lighting scheme. The nursery should be multifunctional in order that the child has a space to play in addition to a space to sleep. 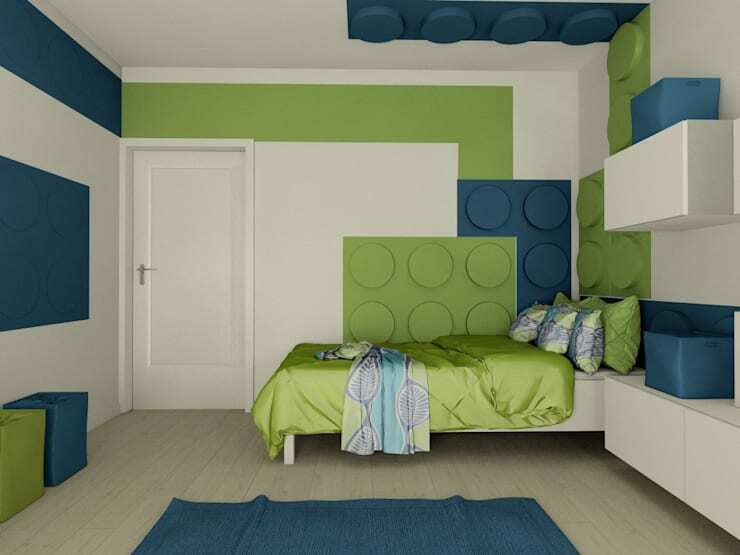 In this environment the use of plaster has a decorative function and turns out to be a fun way to decorate and add colour to your child's room. Do you think you'll use any of these plaster fixtures in your home? We'd love to hear your stories.